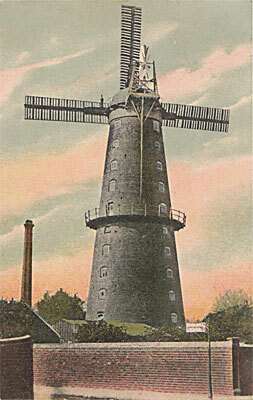 Gt Yarmouth Southtown tower mill, which was often known as High Mill or Press's Mill was 122 feet to the top of the 20 foot lantern and was one of the tallest windmills ever built in Europe, extending to 12 storeys including the ogee cap. The lantern was installed to act as a lighthouse. At ground level, the base of the mill had an outside diameter of 40 feet (also reported at 46 feet) with walls 3 feet thick and it was said that carts could drive into the mill to load up inside the tower. 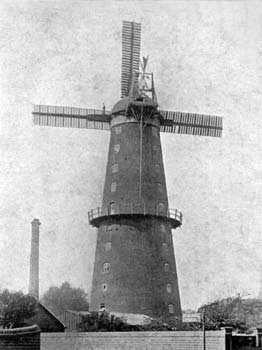 The size of this mill was only surpassed by Bixley towermill. The mill had 4 double shuttered patent sails with an 84 foot span and 10 bays of 3 shutters that drove 4 pairs of stones on the 7th floor, 3 flour mills and 2 jumpers. The ogee cap had a gallery and held an 8 bladed fantail with a chainpole and the stage was on the 6th floor. The windshaft was reported to have weighed 5 tons and when combined with the cap, gallery and fantail the weight was said to have totaled 15 tons. The 4 pairs of stones ground 9 coombs of wheat or 20 coombs of oats per hour. In 1825 Dr. Browne as Rector of Southtown and Vicar of Gorleston took legal proceedings against Woollsey and others to compel payments of tithes on their mills. The defendants contended that they were merchants purchasing corn, grinding it and selling the flour and not grinding other people's grain for profit, as was generally the case with ancient mills, which it was admitted, were titheable. When the case came before the Barons of the Exchequer, they by a majority, dismissed the Bill, but without costs. Dr. Browne then applied to the clergy in general for funds to carry the cause to the House of Lords, but receiving no response, the matter dropped. Notice is hereby given to all persons who are indebted to the Estate of the said Bankrupts to pay the amount of their respective Debts with one month from the date hereof to Mr. Thomas_HAMMOND the younger of Great Yarmouth, Miller, one of the Assignees, otherwise legal means will be taken to enforce the payment thereof. To be Sold by Auction under a Commission of Bankrupt against John WOOLLSEY & John SECKER, of Great Yarmouth, wine & spirit merchants, dealers & chapmen, and on the application of the Mortgagees, at the Bear Inn, Bridge Foot, Great Yarmouth, on 8 September.
. . . the 11 floor mill at Southtown . . .
Pursuant to Certain Orders of the Commissioners under a Commission of Bankrupt awarded and issued against JOHN WOOLSEY & JOHN SECKER of Great Yarmouth in the county of Norfolk, Wine & Spirit Merchants, Dealers & Chapmen and on the application of the Mortgagees the following ESTATES at the respective places aforementioned. All the capital new built WINDMILL situate in Southtown next Great Yarmouth, having a Brick Tower containing eleven floors, the lowest being 34 feet diameter, working four pair of stones, three flour mills and two jumpers, capable of manufacturing upon an average 120 quarters of wheat per week; also a convenient new built Dwelling house with stable, suitable offices and two acres of capital pasture land situate in Southtown aforesaid where the parochial charges are trifling and within 200 yards of Yarmouth Bridge and the Corn Market. The Mill is in full trade with good country and town connections. The above Estate is Leasehold for a term of 80 years of which 61 will be unexpired at Christmas next and is subject only to an annual rent of £20. All the capital Freehold Messuage with shop . . .
All that capital Dwelling-house, with convenient outbuildings, yard and garden, together with the Water-mill, Cottage, and Granaries adjoining, and about 16 acres of Arable and Meadow Land of the best quality, in the highest state of cultivation. And also a Wind-mill and about two roods and 30 perches of Arable Land. The above Premises are situate in Swafield and North Walsham, and are in full trade, and now in the occupation of Mr. Benjamin Postle Woollsey, as tenant from year to year. The Water_Mill, Cottage, Granaries, and about nine acres of the Land are Leasehold of the Bishop of Norwich, for a term of 21 years, commencing the 10th October, 1827, at an annual rent of 3l. 13s. 4d. The Mill commands a good head of water, and drives two pair of stones and two flour mills. The Dwelling-house, Out-buildings, Yard and Garden, and about five acres, three roods, and 22 perches of the Land are Freehold and pleasantly situated. 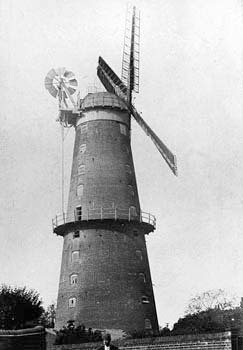 The Wind-mill, which is in excellent repair, and two roods and 30 perches of Land are Copy-hold of the Manor of North Walsham about half a mile. This Estate offers either a desirable Investment for Money, or a good situation for an active Man of Business, having water carriage to the Port of Yarmouth, is within 16 miles of Norwich, one of North Walsham, and 26 of Yarmouth. And at the same time and place last mentioned, will be Sold by order of the Assignees of the said Bankrupt. A Place of Freehold Arable Land, situate in Swafield, near Swafield Bridge, leading over the North Walsham and Dilham Canal, containing about one acre and one rood, and is well calculated for Warehouses, Granaries, Coal and Timber Yards - Also one Share in the North Walsham and Dilham Canal. Further particulars may be had in London of Messrs. Amory and Coles, Solicitors, Throgmorton Street; Messrs. Swaine and C. Solicitors, Frederick's Place, Old Jewry; Mr. Lythgoe, Essex Street, Strand; and in the County, of Mr. Clowes, and Messrs. Sayers and Glasspool, Solicitors, Great Yarmouth. Notice is hereby given to all persons who are indebted to the Estate of the said Bankrupts to pay the amount of their respective Debts to Mr. Thomas_HAMMOND of Great Yarmouth, Miller, one of the Assignees within ten days from the date hereof and that unless the same are severally discharges accordingly proceedings will be commenced without further notice. Great Yarmouth, 15 March 1832. The creditors who have proved their debts and substantiated their claims under the above mentioned Bankruptcy may receive a Dividend upon their respective debts under the Joint Estate of the said Bankrupts and the separate Estate of John WOOLLSEY upon application at the Bank of Messrs. GURNEYS, TURNER & BRIGHTWEN, Bankers, Great Yarmouth. To be Sold by Auction by Pettingill at the Star Hotel, Great Yarmouth on Wednesday, 6 July 1842 at 12 o'c noon. A Capital BRICK TOWER WINDMILL with Respectable RESIDENCE, Gardens, Malthouse, Cottages etc. In Southtown, Suffolk. 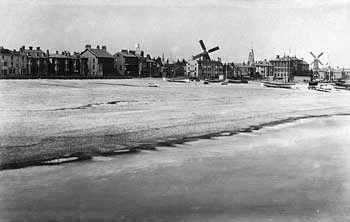 All that excellent WINDMILL situate in Southtown next Great Yarmouth under Lease to Mr. Branford which expires at Michaelmas next, having a Brick Tower containing eleven floors, the lowest thirty four diameter and capable of manufacturing upon an average 120 quarters of wheat per week; a convenient Dwelling House with suitable offices, Stables, Gig and Harness house, Cart lodge, Cow house, Pig cotes etc., well planted Gardens and Pasture Land about 2 acres. The above Premises are well establishes for trade and are about 200 yards from Yarmouth Bridge, near the Corn Market and eligibly situated for doing an extensive Business. The parochial charges are trifling. The above Estate is Leasehold for a term of 80 years of which 51 were unexpired at Christmas last and is subject to an Annual Ground Rent of £20. A Malt House known as "Matsell's Malting" of 30 coombs Steep with Yard, and cottage adjoining situate near Lot 1. Unoccupied. The above Estate is Leasehold for a term of 80 years of which 44 were unexpired at Christmas last and subject only to an apportioned Ground Rent of £2. 10s. Apply to the Auctioneer or to Messrs. Clowes & Son, Solrs. Yarmouth. c.1845 a steam engine to drive an additional 3 pairs of stones was installed. Southtown. Title Deeds of the Press Family Property. 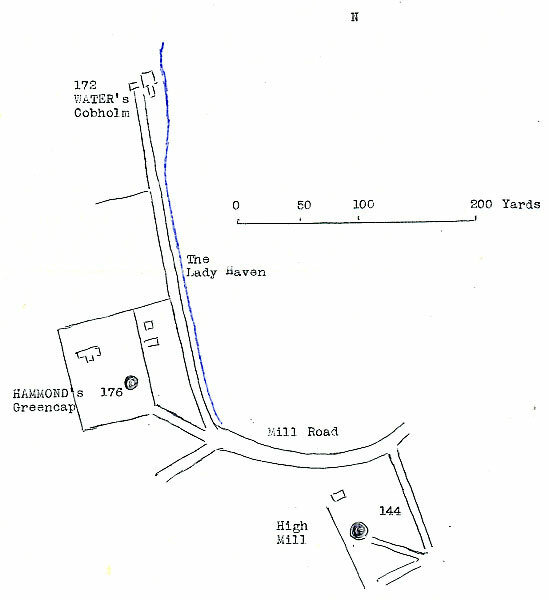 Two acres west of road to Cobholm and south of road to Back Marshes in 1812 leased for term of 80 years by George Anson's trustees to John Woolsey and where in 1812/13 Woollsey had erected a brick tower windmill (later known as High Mill, and a messuage valued at £2000. Property conveyed in 1881 by Stephen John Frederick Stafford to Edward and Benjamin Howard Press. 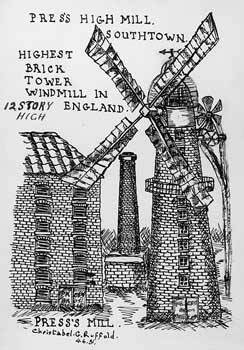 Brick built windmill eleven floors high driving four pairs of stones with boiler house, dwelling house etc. Piece of accommodation marsh next same, sold in 1883 by the Earl of Lichfield and Viscount Anson to Edward and Benjamin Howard Press. i.e. 60 coombs per week per pair of stones. Having examined the High Mill, Southdown, I beg to say I will undertake to execute the following repairs. viz. 1 new clamp to Stock 34ft long 12"x12". To take down the 4 sails and repair do. with new canvas to vanes, new screws & sail irons where necessary, to ease the neck brass, to make a new tail brass, to find new cogs and gear the wheel to drive the flourmills, with the cogs now in the Mill, one wood rigger to do. - to find cogs and gear 2 stone nuts, and repr. 2 pr. universal joints to flourmills with Men's time at Mill taking down and refixing sails &c. in a workmanlike manner will amt. to the sum of Sixty Four Pounds five shillings. £64. 5. 0. Your Obedt. & Hble. Servt. John G. B. ¾ do. The mill worked both day and night; a double shift of four men each was worked. 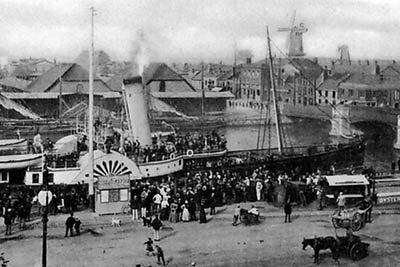 In 1854 during the Crimean War, the mill came into national prominence when its flour was supplied to Lord Raglan's army and shipped by a number of Yarmouth's famous clipper schooners, chartered to race to the Black Sea ports. 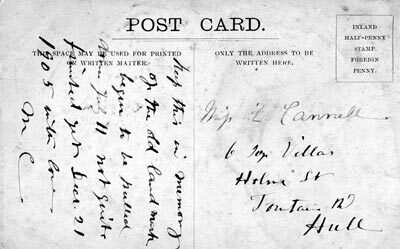 Accident – On Wednesday afternoon Mr Holmes, an engineer belonging to Norwich, while superintending some alterations at the High-mill, Southtown, by some means entangled his left hand in the machinery, and received very severe injuries. 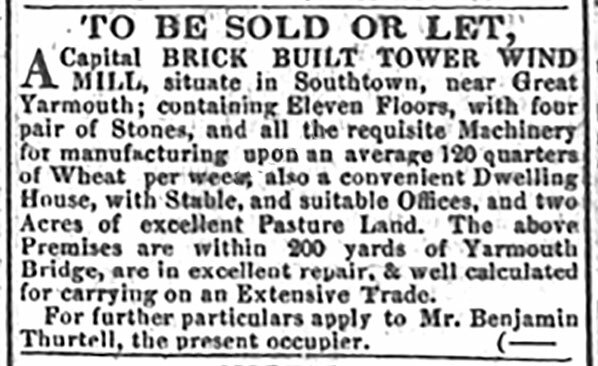 J. W. DE CAUX has received instructions from the Mortgagees to Sell by Auction without reserve on Wednesday July 27, 1870 at 4 o'c in the afternoon at the Star Hotel, Great Yarmouth in One Lot including Fixtures, all that spacious and commodious Brick Tower Wind & Steam MILL situate in Southtown, next Great Yarmouth with the Dwelling House and Outbuildings and 2 acres of Garden Ground and Pasture Land attached. THE MILL is very strongly built and is ain a good state of repair; it contains eleven floors, the lowest of which is 34 feet in diameter. It is fitted with four pairs which are driven by the wind and three pairs of stones which are worked by a Steam Engine of 12 horse power that is driven by a boiler of 16 horse power. The machinery throughout is complete and in perfect working order. The above Premises are remarkably well situate for Trade being in close proximity to the Haven and the Great Eastern Railway Co's Southtown Station. They are now in the occupation of Mr. William Parker and possession may be had at Michaelmas. They are leasehold for a term of 80 years from the 25 December 1812 at an annual rent of £20. Apply to Mr. William Worship, Solr. or the Auctioneers, Great Yarmouth. 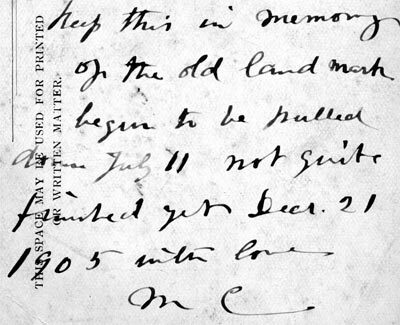 J. W. DE CAUX has received instructions from the Mortgagees to Sell by Auction without reserve on Thursday September 15, 1870 at 6 for 7 o'c in the evening at the Star Hotel, Great Yarmouth in One Lot including Fixtures, all that spacious and commodious Brick Tower Wind & Steam MILL situate in Southtown, next Great Yarmouth with the Dwelling House and Outbuildings and 2 acres of Garden Ground and Pasture Land attached. On the north side of the Southtown Road after passing over the bridge . . . The first road through is called SAW MILL LANE because it leads to a Steam Saw Mill erected by Messrs. SAUL. Here also is a Steam Flour Mill belonging to Messrs. GAMBLING. 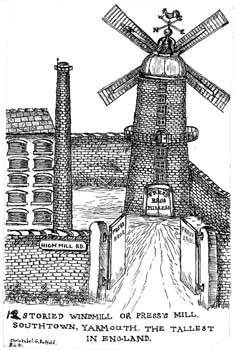 The next to the right at the turn of the road is called MILL ROAD because on the west side of it stands a Tower Windmill, erected in 1813 by Mr. Woollsey. It is 120 feet in height to the top of the cap, has eleven stories and is capable of manufacturing 200 quarters of grain weekly . . .
Further north was another mill, the property of Mr. John WATERS which was burnt to the ground in 1850.
particularly well worth the attention of Builders, Speculators, Maltsters and Investors. THE HIGH MILL ESTATE, containing about one & a half acres most conveniently situate within 5 minutes walk of the Southtown railway station, having frontages of about 236 feet to Mill Road, 73 feet 6 inches to High Mill Road, and 274 feet to Lady Haven Road. Land Tax & Tithe redeemed. 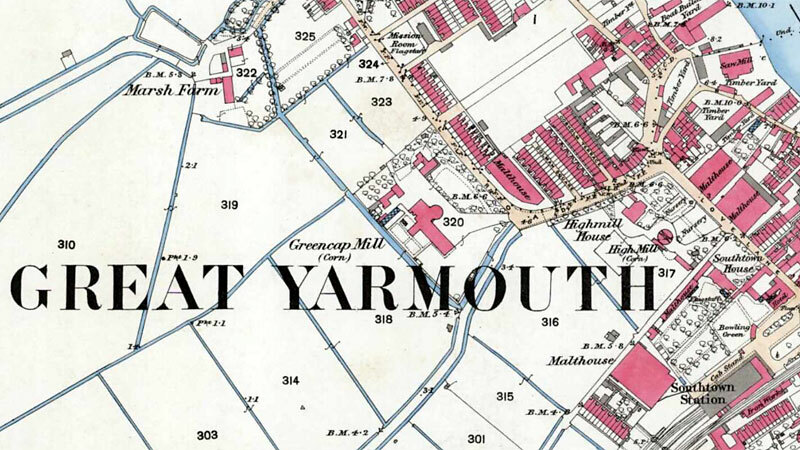 Great Yarmouth, Vendors' Solicitors, at the Estates Exchange, Tokenhouse Yard, London, E. C. or of the Auctioneers, 10 Regent Street, Great Yarmouth & Harleston, Norfolk. Stand No. 51 Corn Hall, Norwich. When the mill was demolished in 1904, the estimated 300,000 bricks were used to build a whole row of terraced houses. The spot where the mill stood was then occupied by nos. 35 & 36, High Mill Terrace, Gatacre Road and is indicated by those two houses having red chimney pots, the others being of stone colour. 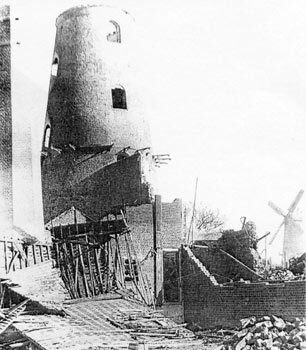 The sails were taken to Roughton_Mill_Hill_towermill as that mill was also owned by the Press family. At Southtown the noted High Mill of Press Bros. stood north of Love Lane, after Jas. Love, the blacksmith. Nos. 36 & 37 Gatacre Road are probably the centre of the High Mill site. Branford the miller had the High Mill in 1842. 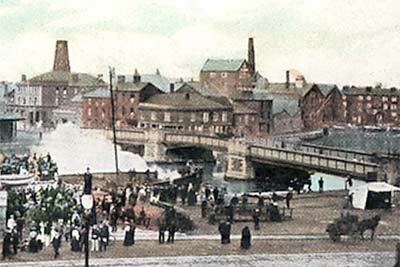 The firm became Branford & Palmer shortly after when the steam mill was added. In the '60s William Parker was owner and I believe the Press family were in possession before before 1870. Work ceased at this mill in 1898 . . . it was announced as for auction on August 24th 1904 following the death of Benjamin Howard Press (Mayor 1899). It was sold to W. W. Willimont for £100 at the Star Hotel by Mr. J. C. Miles and Gatacre Road off High Mill Road was made upon its site. A roadway used to run through the base of the mill, which allowed farmers' waggons laden with corn to be driven directly under the building, the corn being unloaded by a special type of hoisting gear from the centre of the mill. Mr. A. J. Thrower, Great Yarmouth Millwright who worked on the High Mill (Southtown, Yarmouth) etc. told me in 1951, "The Sails from the High Mill were fitted to Roughton_Mill, so she must have been very powerful." Rex Wailes reported that the 4 ft. wheat stones were sent to Saxtead Green in Suffolk. 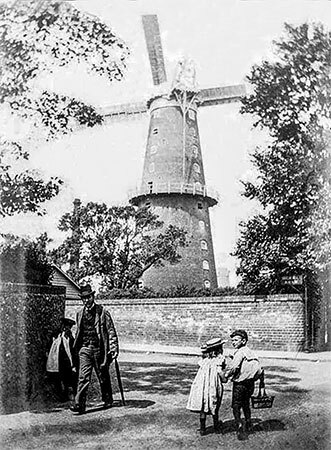 As a child in the 1950’s I was often shown the post card of the High Mill and told that the man standing on the cross arm was my grandfather, Robert Albert Cook, who eventually moved in to No.2 Gatacre Road which was reputedly with from bricks reclaimed from the demolition of the mill in 1905. I am amazed at your website and just sent links to a fellow in Australia who is a descendant of the Presses. I'm not related but interested to know if you have ever come across any reference to, or picture of Arthur George Press (son of Edward Press, one of the Brothers). He died at age 29 in 1900 and left a widow, Florence Lilley (Pye) Press and two children..